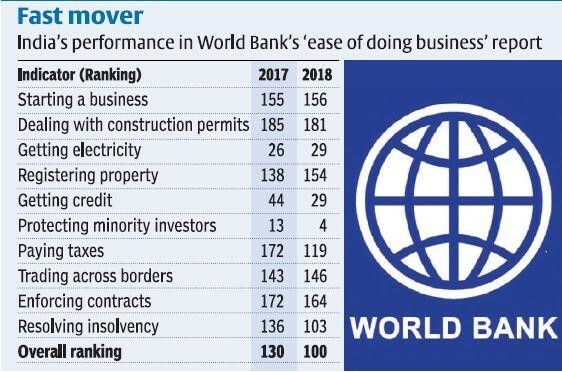 World Bank released its latest version of Ease of Doing business which saw India leapfrog 30 points to enter into top 100 destinations for ease of doing business’. In 2016, India was listed at 130 below countries like Ghana and Uganda. In 2014, the government had said that it would focus on this index and come out with reforms to improve the ranking. 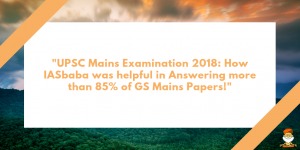 It was disappointing in 2015 and 2016 when there was not much improvement in the ranking. Given that perspective, the present jump is encouraging. The jump shows that the sustained efforts do get the good results and they are not gained overnight. The new government which has vowed to remove red tape, eliminate procedures of delay and turn India into an investment destination has seen the results in context of the recent reforms undertaken and government’s commitment for the same. After the information from these places, the index is put in place. This index is based on what is happening in two Indian cities- Delhi and Mumbai. India is yet to see the result of index which cover more than eight cities. Thus, to say that ease of doing business has improved dramatically for the whole of country would be exaggeration. A better indicator will come by WB which is called as Enterprise Survey which actually goes into details how enterprises in different part of the country perform. Thus, a broader picture of business in India will be known by merging the findings of ease of doing business and world bank enterprise survey. What to be done to reach next level? The push for digital governance should enable India to come into top 30 by 2022 in almost all parameters except two, bankruptcy and enforcement of contracts. Transition to digital functioning has a barrier in the political economy. But now the political establishments in all states would like to have investments and results of the same. So the situation is appropriate and right. For bankruptcy, the process is on and the legislative framework is there. So the system should work well enough with close monitoring and supervision. The real achievement will be to achieve the enforcement of contracts. It is tough one as it basically means bringing efficiency in Indian judicial system. From an economic perspective, the Indian judiciary has been highly inefficient and doesn’t deliver as per the changing times and needs. Methodology challenge- expand the coverage of the index to make it more real. The kind of laws the index looks at are at state level laws and not national laws. So more importance has to be also given to the state level exposures and business performances. Need for factor market reforms- the areas of making the land available should be improved from 190 days. Land allotment, construction permits should be encouraged. The labour reforms- in terms of hiring and retrenching mechanism should be there. Cross border business, i.e. proper trade policy is required to enhance business opportunities. The perception across the world and within India is that there is a rent-seeking environment which makes it ineffective for people to enter into business or SMEs from Europe to come into India. That perception has to change very fast. That is the reason why very few people who are not in India choose to start new enterprises. Rent seeking environment can be altered partly through e-governance and political governance. Ease of doing business is a major building block but it is not enough. It is not sufficient for attracting investment and growth. This index is based on what is there on statute and rules. So the rules should go down to the reality and get implemented. The ease of doing business is directed only to cross-out the administrative hurdles. But to create an investment climate constitutes many other factors and ease of doing business is one of them. The improvement in ranking makes India a better investment destination because the foreign and domestic investors feel encouraged to do the business. At present the investment is stuck because of twin balance sheet problem. The banks are stressed and the corporate sector is overleveraged. Though the bank recapitalization was first good step, it has to be followed up with changes in how banks do their businesses. The findings and recommendations are helping policy makers identify, prioritize and implement reforms of policies and institutions that support efficient private economic activity. Key research topics of the unit include firm performance and job creation, legal gender parity for entrepreneurs and workers, informality, and export performance. Ease of doing business jump is not an achievement. The milestone and the goals are still afar”. Critically examine.